Only I can change my life. No one can do it for me-Carol Burnett. Ashish Singh Negi, a partially sighted sportsman playing under F12 category, is a person truly believing in this. Let us give you an overview of his life and achievements. Born a normal sighted baby, Ashish lost his sight at the age of 7 or 8 years old due to medicinal reaction. Even though all hopes of his parents were crushed, this did not deter his spirits and he continued his studies as well his sports. It was only because of his hard work and commitment that he got chances to play for India in 2 World Cups (Cricket for the Blind) and represented India many times in different series. It was in 2015 when he was working in SBI, Dehradun as a clerk that he met Mr. Naresh Singh Nayal (Athletics Coach, NIVH, Dehradun) and urged to do Shot Put and Discus. They started with a mere throw of 7.48 m in shot put. Mr. Nayal saw great potentials in Ashish because of his determination and hard work. It has now been 3 years since they are working together. 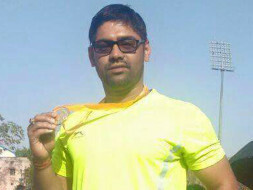 Ashish has IBSA (Indian Blind Sports Association) record in his name with the throw of 10.98 m. He has also won National medals in Shot Put and discus in his category. Also, during the last year trials conducted by PCI, his shot throw of 10.78 m provided him the opportunity to participate in the Fazza International Meet at Dubai. As the kitting sponsor of Ashish Singh Negi, Thrill Zone finds a lot of potential in him. We believe that he can bring laurels for the Nation and so we try to provide him our maximum support. We do not wish to see his talent getting wasted and more over an individual should not feel neglected in this nation of hopes. A fitness and sports trust, Thrill Zone finds this as a golden opportunity to take the talent of a physically challenged individual to international level. The total amount to be generated is of Rs. 160000. This will include his journey from India to Dubai and back, his stay, food and others. It will also be used to pay for the kit which will include track suit, bags(Travel and back pack), T-shirts, tights, throwing vests, shoes, jogging shoes, and throwing shoes. We hope that just like us people also see his potentials and encourage him by providing donations. Thrill Zone Trust is registered 12A and 80G certified NGO, donor will get 80G certificate which is 50% tax exempted. We will send you certificate and donation tax receipt. Once you donate the ammount we will mail you scanned copy and courier you at given address. With the help of your love and support, the funds which we raised has helped us to book air tickets for Ashish to Dubai where he will represent our country. We sincerely thank each one of you for your contributions. Please keep supporting Ashish and keep him in you prayers.